Hi! I'm Christopher and I'm 9 years old. And I'm Kaela - I'm almost 8. My baby brother William is 2. We're working to dig wells in Africa by raising money doing chores. When we received a brochure in the mail from World vision, we felt sad because children were dying from diarrhea and parasites caused by dirty water. We wanted to help, so we asked our mom how to get $3000, which is how much it cost to dig a well. And our mom said, "Go do work." 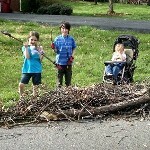 So we decided to do chores all over our neighborhood to raise money to dig a well. Can you please help us? We've raised 40% of our goal, but we need more work. Please help us by giving us chores and donating as much as you can to help the children live! Any money given by the end of August is matched $1 for $1, which would mean we would actually pay to dig 2 wells! !